A scientist and cancer patient who cut dairy products from her diet nearly 20 years ago claims doing so has helped her beat the disease. Jane Plant, who was first diagnosed with breast cancer in 1987, said she believes the disease is inextricably linked to animal products. 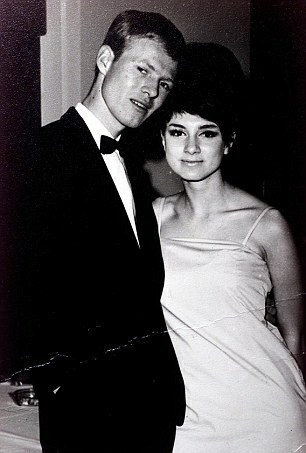 In 1993 when Professor Plant, now 69, was struck down by breast cancer for a fifth time, doctors warned she had just months to live. The secondary tumour, this time a lump the size of half a boiled egg, was growing on her neck. 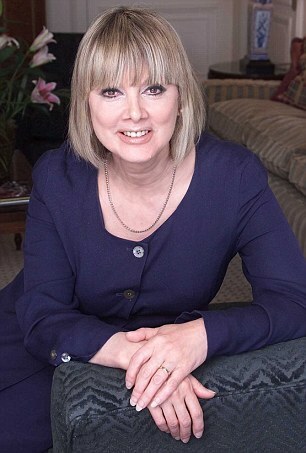 Writing on her website, Professor Plant said: ‘I was first diagnosed with breast cancer when I was 42. ‘I thought I’d beaten it, but five years later it returned with a vengeance. ‘I carried on fighting, but when it recurred for the fifth time I asked my doctor to end my life for me there and then — I didn’t see how I could go on battling a disease that seemed hell-bent on finishing me off. ‘But as I wept I heard my little boy, then just six years old, crying out for me in another room. I knew then I could never again allow myself to feel as though it was an option to leave him. ‘Five weeks later, when I was told that I had, at the very most, two months to live, I wasn’t upset, angry or frightened — I’d already hit rock bottom a few weeks earlier. I was on the way back up now and had already begun to search my own scientific mind for a way out of this mess. ‘I was gripped with a great sense of urgency that I had to find an answer quickly if I was to stand any chance of surviving. Drawing on her experiences of working in China, she was aware that Chinese women had historically shown very low rates of breast cancer. 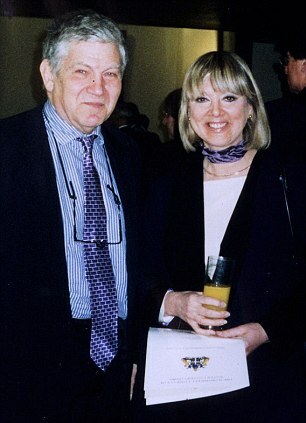 ‘My husband Peter and I had both worked in China on environmental problems in the past,’ she said. ‘I suddenly remembered that a wonderful epidemiological atlas presented to me by my Chinese colleagues showed a background rate of breast cancer of one in 100,000 women, compared to a rate of one in 10 in much of the West at that time. Yet for those Chinese women who moved to live in the U.S., UK or Australia and who lived on western diets, the rates were more in line with western rates. The mother-of-two, added: ‘I knew that Chinese women living on western diets, for example in Singapore or in Chinatown in Britain, did have breast cancer. ‘Peter and I brainstormed the subject for just a few minutes and decided that it must be diet related. We then remembered two incidents. The revelation inspired her to switch to a dairy-free, Asian-style diet. ‘I decided I had nothing to lose by giving up the two low fat organic yoghurts I was eating a day each day,’ she added. She also cut out most animal protein such as meat, fish and eggs and banished all milk products. Within six weeks – during which time she was undergoing more conventional treatment, including chemotherapy – the lump on her neck disappeared. Within a year, she was in remission and lived cancer free for the next 19 years. Professor Plant believes while going dairy-free helped her breast cancer, it could prove beneficial for those patients diagnosed with colorectal, lymphoma and throat cancer. ‘We have all been brought up with the idea that milk is good for you,’ Prof Plant told the Telegraph. ‘But there is evidence now that the growth factors and hormones it contains are not just risky for breast cancer, but also other hormone-related cancers, of the prostate, testicles and ovary. Her book, Beat Cancer, explores the science of epigenetics, how genes ‘behave’ and are regulated, including how they are influenced by the environment. 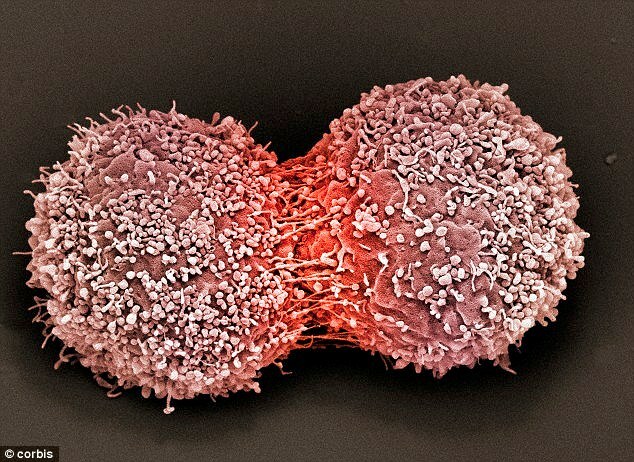 Scientists understand cancer-causing genes may not become active until particular conditions arise in the body, to effectively switch them on. Equally, the science suggests those that can be switched on, can also be switched off. Therefore this means that what a person eats can have a genetic impact. Scientists believe cancer cells are hypersensitive to chemical messenger proteins called growth factors, as well as hormones, including oestrogen. Growth factors are produced by the body, and perform vital tasks such as making cells grow. The risk of cancer comes when we have abnormally high levels of growth factors in the blood, circulating the body. Professor Plant and her co-author, Professor Mustafa Djamgoz, state the same growth factors and hormones responsible for the growth of cancer cells, are found in food that comes from animals. They say certain foods provide the ‘fertiliser’ cancer cells need to grow, with the main protein in cows’ milk being considered the most dangerous. A leading U.S. nutritional scientist, Professor Colin Campbell at Cornell University, has aruged that cows’ milk should be regarded in the same category as oestrogen, as a leading carcinogen. For those patients already diagnosed with cancer or those shown to be at high risk of developing the disease, she advocates, among other things, cutting out all dairy – from cows, sheep and goats, and whether organic or not. Her new book, Beat Cancer, draws on a study more than 30 years ago that claims more than a third of all cancers might be attributable to dietary factors. Professor Plant advises eating more plant foods and less red meat, sugar, salt and fat. She also urges people fighting the disease to take regular exercise and reduce their stress levels. The book advises people to opt for organic foods. 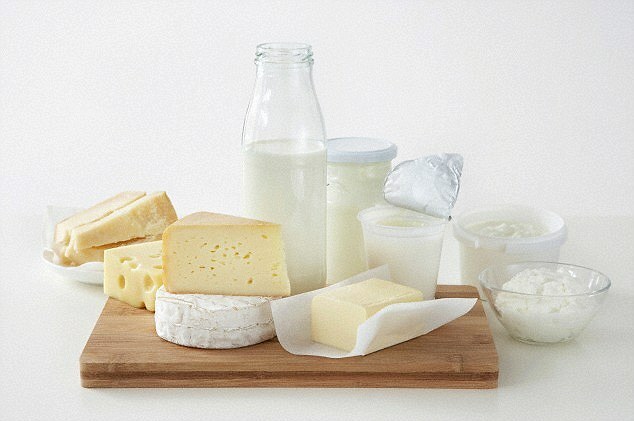 But the more radical suggestions are that by totally excluding diary products, cheese, milk, butter and yoghurt, you can successfully halt the disease ‘in its tracks’, by preventing the cancer cells of the conditions they need to grow and spread. She originally published her story in her international bestseller Your Life In Your Hands, which was credited with helping thousands of cancer patients. But three years ago, the demands and pressures of writing another academic book caused her diet to slip. She said she let herself believe the odd egg sandwich from the college canteen would ‘do no harm, even it it contained butter or spread’. ‘And what about my check-ups?’ she added. ‘Unfortunately I had stopped attending these about 10 years ago. ‘At the time I told myself it made me too anxious and after all I had found all my cancers myself. She said when her husband pointed out a large lump beneath her collar bone, she persuaded herself it was just scar tissue. ‘It was not until I was admitted to hospital as an emergency – unable to breathe – that I took any action to help myself. ‘Scans carried out at the time showed that the lump beneath my collar bone, was cancer. ‘It had also spread to the lining of my right lung, which also had several small metastases in it. ‘Later I checked back on what I had been eating. I found that even the falafel from the canteen contained milk powder and I had been eating calves’ liver cooked in butter about three times a month at a local restaurant where I entertained visitors. ‘I went straight back to my oncologist – who prescribed a small daily dose of the oestrogen-suppressor drug letrozole, which I continue to take,’ she added. ‘Importantly, I went back on my Plant Programme 1 diet, began regular meditation again and ensured that I started walking regularly as I used to do before my workload became too intense. ‘Of course overcoming my cancer was not as simple as just giving up dairy. In fact there are 10 dietary factors and 10 lifestyle factors that are important in preventing and treating cancer. This applies not only to breast and prostate cancer but all cancers. 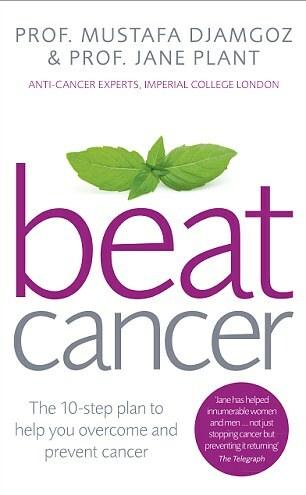 In her latest book, Professor Plant, a professor of geochemistry at Imperial College London, advises people of the importance of diet when fighting cancer. Co-written with Mustafa Djamgoz, professor of cancer biology at Imperial, the book is hailed in its foreward, written by ProfessorSir Graeme Catto, president of the College of Medicine, as ‘important’ and one which should be ‘taken seriously’. Prof Catto adds: ‘This is not a conventional cancer book. You will find many of the things you read illuminating, some of the information may be surprising and even, at times, shocking.